Ph is a scale chemist use to measure acidity. 7.0 is neutral below this is acidic and above this is considered alkaline. St. Augustine turf usually grows best with a Ph between 6.5 and 7.5. When soil Ph is too low or too high it can cause the turf to decline. A wide range of problems can occur. Under acidic conditions metal ions increase to toxic levels inhibiting proper plant growth. In alkaline soils minerals decrease to the point where they are no longer present and deficiencies occur. When soil is lower than 6.5 it is considered acidic . When the soil is acidic it does not uptake nutrients and usually will require lime to increase the level of Ph. After we receive a soil analysis back from the lab they will give further recommendations. Depending on the severity of the problem it may take several treatments to adjust. When soil is higher than 7.0 it is considered alkaline. Under alkaline conditions nutrient deficiencies can occur thus depleting the soil of proper nutrients to grow adequately. Again, we take the recommendations and work to adjust the Ph to an appropriate level where there are no longer toxic minerals. 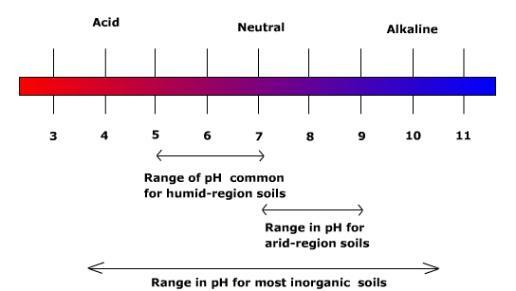 With alkaline soils it can be difficult to lower the Ph. In most cases it is easier to manage the difieicines rather than acidify the soil.